It is with great pleasure that we can announce the adoption of Zack!!! Through the power of social media - Zack's new family fell in love with him after looking at his pictures and blog! The RSPCA take great care to make sure their rescues only go to homes that are best suited for them and the adoptive family, ensuring they will have the every happiness they deserve. 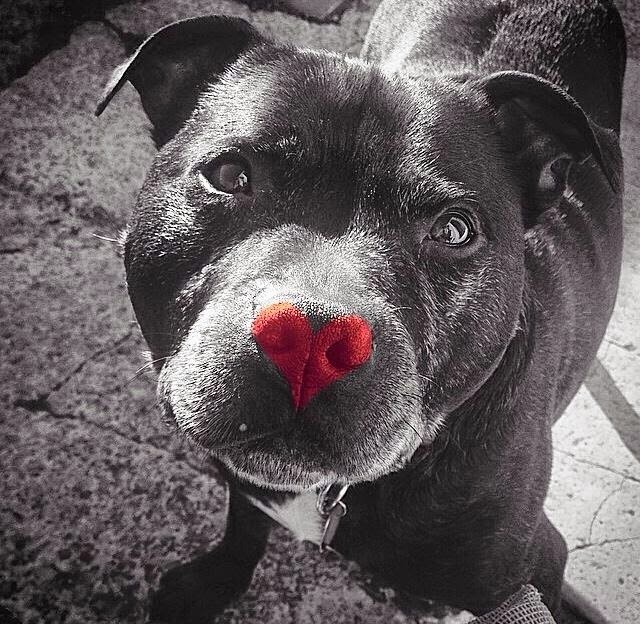 Zack was hoping to find his Forever Valentine this year, unfortunately the right one hasn't turned up just yet - but he knows they are out there and hasn't given up hoping! How can anybody resist this face.....!!!! Could this year be my year.....I have lots of love to give??? Zack just loves cuddles - I think he would prefer a cuddle over a biscuit any day. He really has such a sweet temperament and has quite clearly been loved in his previous home, he just needs somebody to continue to give him that love and attention that he deserves. Zack has had a lovely time this past week, we went to a dinner party at a friends house and he was a perfect house guest. He even met their little terrier dog and they got on great (he was a little scared at first, even though she was smaller than him!). Looking smart in my new collar!! And after a fun filled weekend of meeting new people, playing ball in the park and chasing his tail - Zack was more than happy to be a lapdog for Sunday snuggles. Zack has been in my foster care for a couple of weeks now and it really feels like he has been a part of my life forever. He loves home life and really has settled in so well. He loves to play with his toys - balls are definitely his favourite, he is walking really well on his lead too. There have been fireworks going off this weekend which when he is outside and hears them he barks at them, but has been fine snuggled up on the sofa with the tv on. Zack is my first foster dog. His owner contacted the RSPCA for help as he was made homeless, he'd had Zack his whole life and didn't want him to be passed from one place to another, it wouldn't have been fair on Zack. So the RSPCA agreed to take him in to find him a secure and loving forever home. After 4 months in the kennels, Zack found his foster home at my house!! He has settled in straight away - and loves having home comforts again. Zack is an 8(ish) year old Staffordshire Bull Terrier, he is neutered, vaccinated and micro-chipped with no medical problems. He loves walking, playing with toys and still has loads of energy so don't let his age fool you! He gets on with small dogs but is a bit nervous around big ones. He is fine walking past them. On the lead is a bit of a puller but improving a lot with it. He is not a fan of cats - but is great children. I would suggest that his new home be 'small child free' though as he deserves lots of love and attention - which he loves. Zack is a perfect house guest - no chewing of anything other than his toys, sleeps in his own bed and he is toilet trained so will let you know when he needs to go. He is fine to be left no longer than 5 hours. He loves to meet new people and everybody that he has met at my house has instantly fallen in love with him. My favourite part of Zack is his cuddles, he really does give the best ones and loves to sit and chill out on the sofa.